Gambling and blockchain are two fields at the epicenter of a new wave of competitive technological innovation. These innovations are driving people crazy and revolutionizing the way they do business within different industries. Companies continually strive to stand out from the crowd, and the quickest way to differentiate themselves is to deliver the best user experience or to implement new, unusual features. Almost all spheres feel the effects of blockchain;; retail, medicine, insurance, financial, and real estate are impacted tremendously. But the gambling industry seems to be the particularly interesting for the application of blockchain technology. Blockchain introduced effective solutions for gamblers. It offers blockchain-based games providing the long awaited transparency in the industry. Now gamers can get unique gaming experiences and convenient in-game transactions between different games. Our tech world has begun to move forward, and the first significant results in this area have already been achieved. Although Blockchain has many positive aspects for gambling like full anonymity of the public ledger, data security, and fast payments, several significant pitfalls obstruct good gaming experiences. In most cases, players don’t have a common infrastructure to play games. Only the top games have robust ecosystems. Brands spend a lot of money on sponsorships and advertising. However, they have almost no close contact with prospective millennials. Companies struggle to attract target audiences, throwing tons of irrelevant advertising at gamers. Player data is insecure, with the lack of privacy negatively influencing their performance in games. Taking into consideration everything said above, Bitbook has come up with an ideal solution for facing these challenges. What is more important, the key to solving the industry’s problems lies not in specific software but in the creation of a whole new ecosystem. By using the benefits of trendy blockchain technology, Bitbook has designed a platform to combine state-of-the-art IT solutions from the online gambling market with innovative blockchain technology. The platform can be accessed by anyone and from everywhere. Bitbook has the potential to reach a worldwide audience of passionate gamblers and betters. Regardless of time and location, they can place sports bets and play casino games while profiting from marginal deposit fees and fast payouts. As an online casino and sportsbook entirely based on blockchain tech, players will be able to look into the transaction stream of Bitbook. This way, every transaction is transparent to everyone, and the informational asymmetries between players and casino operators are eliminated. Users can retrace all prior transactions and thereby trust the integrity of the platform. The main difference between Bitbook and other companies is it uses different cryptocurrencies and BXK tokens, allowing players to deposit funds swiftly. Bitbook offers fast payment and swift transactions by using cryptocurrency technology which respects the player’s privacy. The winnings cannot be blocked or confiscated by a third party. Furthermore, there is no limit to the funds that can be deposited, and the chances for a failed transaction are meager compared to traditional bank deposits. The company has developed the first blockchain-based platform to offer sports betting and advanced casino games at the same time. Furthermore, the betting options and the casino games are more advanced and diverse than traditional gambling and betting solutions. The Bitbook solution is a platform with a variety of games and betting options through the Bitbook Sportsbook, slot machines and card games. The Casino has 200+ games of different kinds–over 150 slot games and 9 different variations of roulette. The sportsbook offers odds on popular sports throughout the world, from worldwide European soccer to American football, baseball, hockey, basketball, car racing, tennis, golf and more. It provides users with the ability to place bets on the outcome of sporting events and functions anywhere in the world from their computers as well as their mobile devices. Football, soccer, and basketball are some of the most popular categories among sports gamblers. Other games offered include baseball, hockey, tennis, golf and many more. The Bitbook casino games are licensed through known online casino providers as Betsoft, Bgaming, and Isoftbet, who have verified their algorithms through trustworthy authorities in the online gambling industry. Thus, Bitbook offers a transparent and fair online gambling experience through well-known and authoritative third party game providers in the industry. As for card games, Bitbook currently offers games for players who wish to play against the casino. As with slot machines, these games are carried out through licensed and audited third party providers, Betsoft, Bgaming, and Isoftbet, thus ensuring fair rules and winnings distribution for all participants. 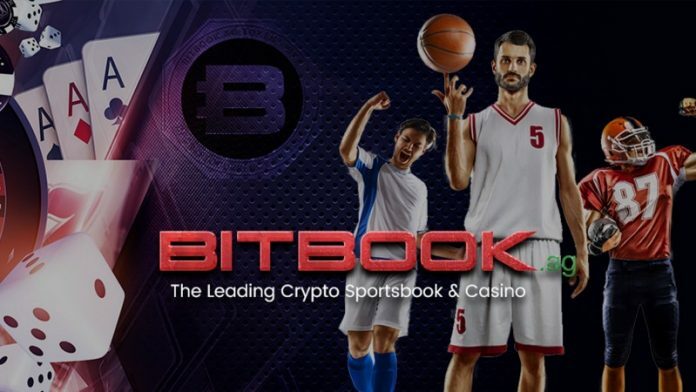 Another significant fact about the Bitbook online sportsbook and casino is that it requires a minimal amount of information for a user to create and to verify his account. The company offers a reliable and convenient token system. Upon completion of registration on the website, the user is redirected to the deposit page where he/she is able to buy BXK tokens from an exchange. Once the purchase of tokens is completed, users can transfer their BXK tokens from their wallets to their Bitbook account and receive a special welcome bonus of 100% additional BXK Tokens for free. This continuous program runs indefinitely and is offered to all BXK Token users. Moreover, users have the option to deposit, play and place bets using different cryptocurrencies readily available on exchanges. If the user wishes to retrieve his funds, he can request his tokens be sent to another wallet at any time. All tokens are released on the Ethereum platform according to the ERC20 standard. In addition, there are numerous advantages to using BXK tokens. If a client wants to transfer funds to or from his account, this can be done with little time spent on administrative procedures and checks. Transactions are processed efficiently and at minimal cost. All Bitbook operators can transfer funds globally. Gamblers have the ability to get fast payouts at any time and they can exchange their tokens for any cryptocurrency. Bitbook provides them with exclusive bonuses and gives a 10% return on their losses. People adore playing games and worship money. Blockchain solutions provide us with great possibilities for realizing these aspirations at the same time. Many blockchain-based projects are gradually appearing, and their advantages like full transparency of in-game transactions, an opportunity to earn when playing, privacy and safety of accounts, and active communication among gamers are apparent. This is only a start. Blockchain gambling is inevitable, and the opportunities emerging at this point are truly incredible!